After drinking nearly a month’s salary worth of cognac the night before, the morning got off to a comparatively low-key start with breakfast at Della’s Kitchen, located in the lobby of the Delano. Run by Chef Jay Calimlim (who oversees all of the food in the building, including 3940 Coffee + Tea and in-room dining), Della’s Kitchen offers delicious rustic meals with a slightly upscale feel. 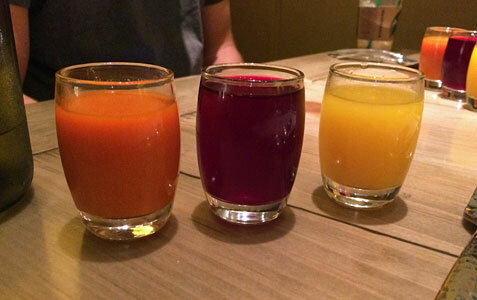 Better yet, a majority of the ingredients are locally sourced, and you can really taste that freshness in everything from the berry compote atop the Belgian waffle, to the unique trio of handcrafted juices. From there, our group headed outside to the Strip to see some of the ways that MGM is making their properties more social – namely, the open walkways in front of Monte Carlo and New York, New York that are designed to provide passersby easy access to the hotels and restaurants that surround them. Though the changes at New York, New York are still under construction, Monte Carlo has debuted a number of new places perfect for grabbing a quick bite while you bask in the nice weather and people-watch on the Strip. Double Barrel Roadhouse is a BBQ-themed restaurant with some delicious appetizers, Yusho offers Japanese-style street food from a cart located on the patio, and BLVD Creamery features liquor-infused ice cream and sorbet (in addition to the usual array of flavors) that any adult will enjoy. A quick tour of the Shark Reef Aquarium at Mandalay Bay was followed up by a relaxing trip to BATHHOUSE Spa inside the Delano. Decked out in everything from dark slate and suede-covered walls, to trendy fixtures and funky, brightly-colored furniture, the spa has a really cool ambiance that feels like being at a nightclub without the loud music. In addition to the usual selection of steam rooms, saunas and hot tubs, there are also 12 treatment rooms where you can enjoy a variety of massages, wraps and facials. Having never experienced a hot stone massage before, I opted for the Desert Stone – 50-minutes of pure bliss that helped melt away the stress and tension that had been built up from all my traveling the day before. It also put me in the perfect state of mind to enjoy our group’s next meal at Fleur by Herbert Keller, the renowned French chef who appeared on “Top Chef Masters.” A Wine vs. Beer pairing dinner created by Mandalay Bay duo Sarah Johnson (Director of Food and Beverage) and Harley Carbery (Director of Wine), the meal was comprised of four excellent courses featuring, you guessed it, a wine and beer with each one. Though my love of wine made the decision easy when it came to picking sides, Johnson deserves kudos for converting a few of my fellow guests with her beer choices. And if you’re ever in Vegas and want to plan a Wine vs. Beer dinner of your own, you can schedule an event through the MGM Resorts page. It’s a lot of fun for a big group, whether you’re with family, friends or co-workers. 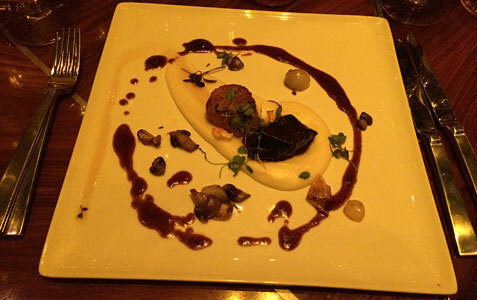 But even if that’s not your thing, definitely plan on stopping by Fleur, because their Braised Angus Short Rib is absolutely killer, especially when served with the restaurant’s fingerling pomme puree. 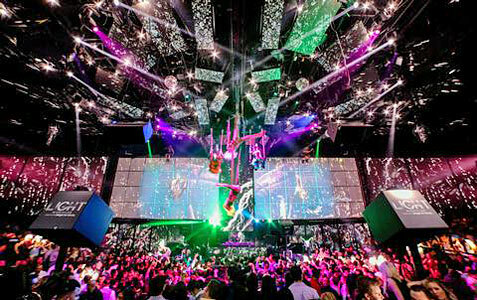 Those looking for another dose of Cirque du Soleil after the show can head to LIGHT nightclub in Mandalay Bay where, in addition to hosting some of the biggest DJs in the world, members of the Cirque troupe perform at various times throughout the night. The club is a sensory overload of pulsating beats, lights and fog, but it definitely wins points for creativity thanks to the added twist of seeing Cirque performers twirl on poles and swing from the ceiling while you sit back and chill with your friends. The cocktail waitress uniforms also don’t leave much to the imagination, so it’s a great place to hold a bachelor party without the ickiness of a strip joint. With that said, LIGHT isn’t for everyone, and you’ll know exactly which group you fall into the minute you step inside. My final day in Vegas was a lot more laidback, but it was still filled with some fun moments. 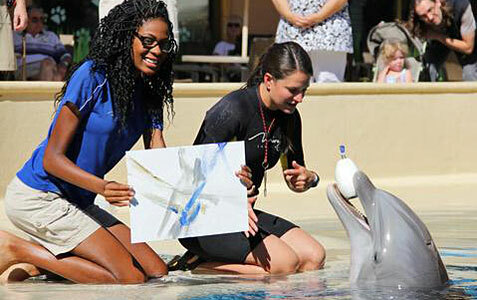 It began with a VIP tour of Siegfried & Roy’s Secret Garden and Dolphin Habitat, where I had the opportunity to “paint with the dolphins,” a good alternative to those that don’t want to get into the water. It’s a much cooler activity than it sounds, as the dolphins grab hold of innovative buoy brushes with their mouths and paint on the canvas while you hold it for them. You also get to do some basic tricks with the dolphin, as well as take home the finished artwork. But perhaps even more interesting than the activity itself was speaking with a couple of the dolphin trainers who work at the habitat. When one of the writers in my group asked about “Blackfish” – the 2013 documentary about the controversial captivity of killer whales – they were quick to not only debunk it as piece of manipulative filmmaking, but educate us on more of the backstory around the movie that provided another side to the story. After a delicious lunch at the Chef’s Table at Buffett Bellagio, a unique dining experience that gives Chef Robert Ferris a creative outlet to deliver heightened versions of the same food served on the buffet line, I was treated to another massage, this time at ESPA Spa at Vdara. Boasting a more intimate setting compared to the modern design of BATHHOUSE, ESPA is a slightly nicer health spa that feels more traditional in every way. It offers many of the same services as the one at Delano, but with the addition of a Mediation Room that, while it may seem trivial, is a very inviting area to relax in after your treatment. My next stop wasn’t an MGM property at all, but rather the extremely nice Four Seasons hotel, where our group enjoyed pre-dinner drinks on the stylish outside patio at PRESS (a neat hangout spot for any time of day) before heading into the neighboring Veranda for dinner. Reopened only a month ago with a brand new direction and menu from Chef Antonio Minichiello, Veranada is an Italian-themed restaurant with some tasty flatbreads and really innovative dishes, including their signature La Pasta Cotta Nel Vaso, which is cooked (and served) in a large glass jar. 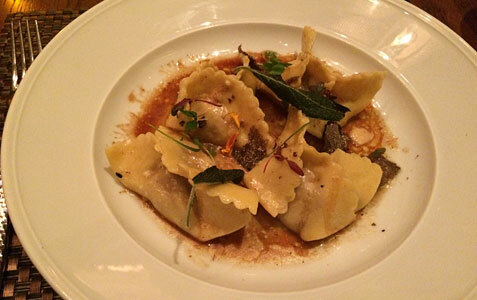 But my newfound love of short rib led me to try the Torelloni Zucca e Manzo, a homemade tortelloni filled with braised short rib, pumpkin, smoked brown butter and winter truffle. 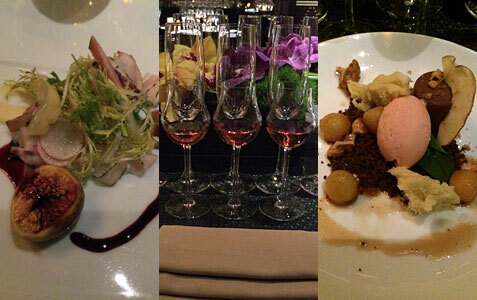 It was as delicious as it sounds, and yet another culinary highlight of the weekend. 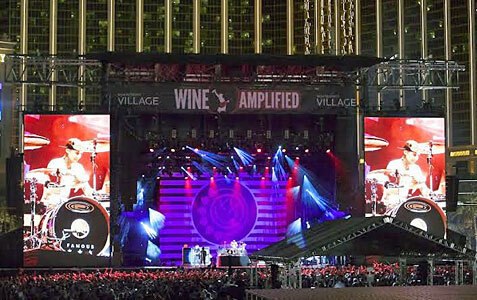 Before I said goodbye to Las Vegas, we had one more stop: the Wine Amplified music festival at MGM Resorts Village, featuring bands like Blink 182, Train, Magic! and Violent Femmes. Staged on a 15-acre lot across from Mandalay Bay, the wine and music fest is just one of the ways that MGM is utilizing what was basically an empty parking lot a few years ago. It also serves as a prime example of how the company is thinking outside the box in order to provide better options for its visitors. Gambling may have been the main attraction in years past, but with so many excellent restaurants, shows and luxury pools, spas and nightclubs at your disposal, it’s no surprise why Las Vegas has developed into a top travel destination for a new kind of clientele.